The Cultural Center's Aaimpa' Café brings a taste of traditional Chickasaw cuisine to the masses. 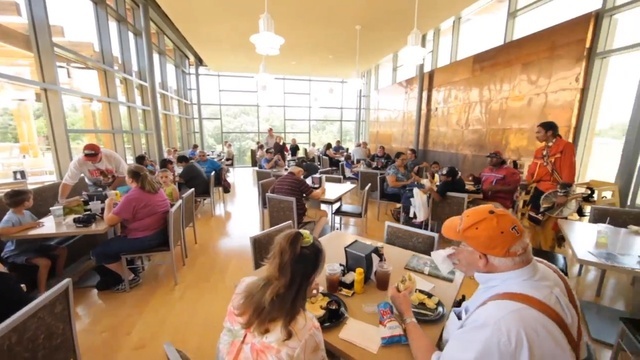 Meaning "a place to eat" in the Chickasaw language, the Aaimpa' Café offers such favorites as pashofa (cracked hominy corn), Indian tacos, grape dumplings and three sisters salad (romaine lettuce topped with squash, corn and beans). If your adventurous spirit has taken a vacation, the café also serves American sandwiches, wraps and hamburgers. Naming the AAIMPA' Café on Chickasaw.tv. The picturesque on-site Spiral Garden provides fresh produce for many of the dishes in the Aaimpa’ Café. In Chickasaw tradition, the spiral shape signifies a long life, one that’s a never-ending journey. Surrounding the Spiral Garden is the Three Sisters Garden, a demonstration of an ancient system of growing food through companion planting. For more information about the Spiral Garden, click here. Chickasaw Community Gardens on Chickasaw.tv.